AshleyNewell.me: Pirate Invite and We NEED Votes! Pirate Invite and We NEED Votes! Hi friends! I hope you are all having a great day! We started this morning with breakfast at McD's and Brady made a new friend. We picked up a few last minute things for the kids's pirate party this weekend, too. I'm exhausted and it's only lunch time! Gah! 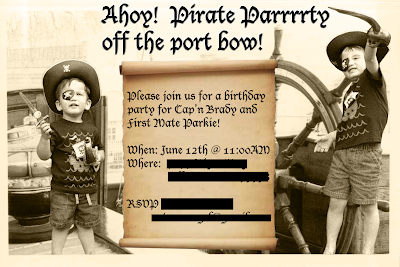 Today, I've decided to share the birthday invite that we made for the boys's birthday. I took the picture in our backyard and Dustin Photoshoped the kids onto this old ship. Really, he made the whole invite, I just took the picture and bought the outfits. Isn't it cute?! SUPER duper cute! I am headed over there to vote!! Great job, Dustin--and you too, Ash! The outfits are CUTE!